But when Red Dwarf hit 25 in 2013 and 30 in 2018, the landscape could barely have been more different, thanks to what happened towards the end of that twentieth anniversary year. Twenty years ago today, Red Dwarf VII debuted on BBC Two. This has made a lot of people very angry and been widely regarded as a bad move. Red Dwarf had been away for over three years, having previously managed to average out as an annual event for six series. 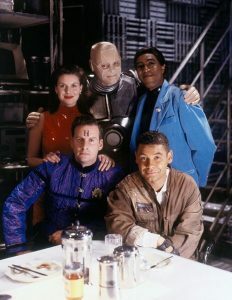 The delay was mainly caused by three monumental behind-the-scenes events: Chris Barrie deciding to leave the show; Craig Charles being held on remand on a charge from which he was ultimately cleared; and Grant Naylor splitting as a gestalt writing entity, leaving Doug in sole command of the show. Big changes were also afoot on-screen, with the change to single-camera, audience-free shooting, the addition of a film effect, a move to a comedy-drama format, and Rimmer’s place on Starbug being taken by Chloe Annett as a version of Kochanski from an alternate universe. In many ways, it was twenty years ago today that Red Dwarf changed from what it was then to what it is now. The reason those first six series still exist in a bubble is that they were all made in broadly the same circumstances. The cast and crew may have altered over the years, and the production may have moved from Manchester to Shepperton, but these changes took place slowly and naturally; to paraphrase another comedy that debuted in 1997, it was evolution, not revolution. With Series VII, that changed – a conscious effort was made to make things different from the previous series, and it was against a backdrop of production problems and uneasy compromises. Red Dwarf lost its momentum, and it’s been fighting to get it back ever since. It’s only now that it’s starting to feel more smooth and assured; Series XII will be the first time in years that there hasn’t been a raft of changes since the previous series, and that’s only because they were shot back-to-back. Opinion remains mixed on the merits of Series VII. The G&T staff are pretty unanimous in our disapproval, but elsewhere there are plenty of fans who enjoy it for what it is, regardless of how different it is from what came before, and even some who hold it in the same regard as the first six series. 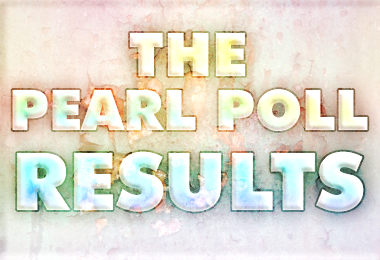 Regardless of your position, what’s interesting is how it came together, and the developments that took place prior to the episodes reaching the screen. To help with the extra workload caused by Rob’s departure, and the series containing two more episodes than usual, Doug brought additional writers on board for six of the eight initially-planned episodes. How this process worked has always been a great source of speculation, and to celebrate the twentieth anniversary of the show’s first big comeback, that’s what we’re investigating today. Bored? Tense, nervous headaches? These two Dwarfy bits and bobs should cure what ails you (or make it considerably worse) until the weekly TOS fix comes along. New Audio Releases! Rob Grant! TOS celebrates the 20th Anniversary of the first transmission of Future Echoes with one of the most interesting updates we’ve had in a while.